V2550. 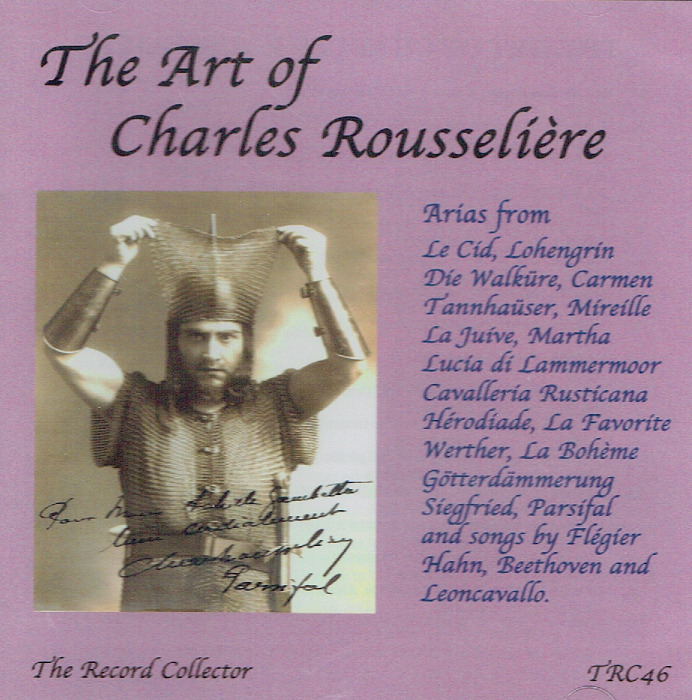 CHARLES ROUSSELIERE: Songs by Beethoven, Holmes, Flegier & Leoncavallo; Arias from Cavalleria Rusticana, Martha, Lucia, La Favorite, Mireille, Le Cid, Werther, Carmen, Herodiade, La Juive, Sigurd, Die Walkure, Siegfried, Gotterdammerung, Parsifal, Lohengrin & Tannhauser. (England) The Record Collector TRC 46, recorded 1903-30. Transfers by Norman White. 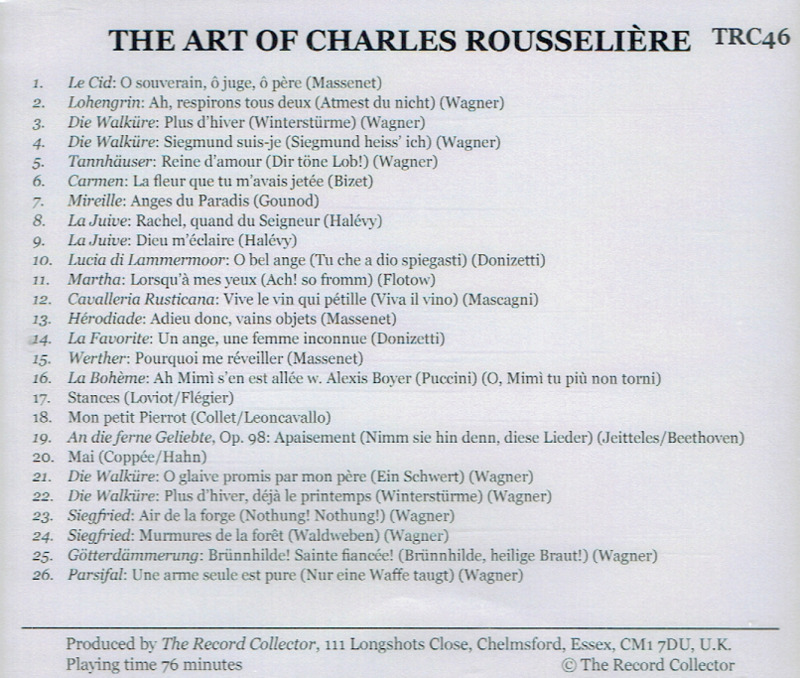 “Charles Rousselière (1875-1950) is a name known to only the most serious of vocal collectors. He belongs to a grand tradition of French spinto and dramatic tenors of whom Léon Escalais and Paul Franz were probably the most prominent representatives. Others from the same period whose names might be familiar to collectors are Lucien Muratore and Charles Dalmorès, and André d’Arkor and César Vezzani from a later generation. Rousselière’s voice has a firm center, plenty of power balanced with a feel for the lyrical line, and a wonderful mezza voce. A few high notes on the present release seem a bit tight, but others ring out with real authority. He seems equally at home in Wagner as in Massenet and Gounod. There are extensive Wagnerian excerpts on this disc. 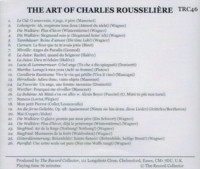 Most of the recordings reproduced here are acoustics from 1903, but in 1930, after he had retired from the stage, Rousselière returned to the studio to make eight electrical recordings. Two are songs by Beethoven and Reynaldo Hahn; the other six are Wagnerian. Rousselière sang at the Paris Opéra beginning in 1900, debuting as Samson, and he quickly became one of the company’s leading tenors. Apparently his singing of the title role in SIEGFRIED garnered comparison with his predecessor Jean de Reszke. The Wagner solos, particularly those from 1903, demonstrate a natural feeling for the idiom and a strong, ringing tenor. Even the 1930 electrical recordings are thrilling, though the voice has lost just a bit of its juice. Here is a singer gifted with power and an equal degree of sensitivity. The recording of Siegfried’s ‘Forging Song’ is the stuff of legends. In addition to Paris, Rousselière was a star at the Monte Carlo Opera for a decade and sang in Montevideo, Buenos Aires, Madrid and Barcelona. He had the privilege of introducing PARSIFAL to Argentina at the Teatro Colón in 1914. There are some lovely examples on the program demonstrating Rousselière’s musicality, such as the final song from Beethoven’s AN DIE FERNE GELIEBTE and the seamless legato in the Donizetti selections. Although I had read Rousselière’s name in J. B. Steane’s THE GRAND TRADITION, I had not encountered him before receiving this disc. I was thrilled with what I heard, and continue to be on repeated listening. There are a few oddities, such as ‘Pourquoi me réveiller’ from WERTHER, which is taken at a very fast clip (perhaps to fit onto a disc), but for the most part these are deeply satisfying recordings of a major voice that will be a wonderful discovery for anyone with an interest in the development of singing in the early twentieth century. "Rousselière's debut at the Metropolitan in ROMÉO ET JULIETTE in 1906 coincided with that of Geraldine Farrar , who received more attention; his dramatic skill was appreciated but the power of his voice, sometimes strident, suggested that he should turn to more heroic roles. This he did on his return to France, adding Otello, Lohengrin, Siegfried and Parsifal to his repertory. He also appeared in Berlin, Buenos Aires and Milan, and in his later years sang mostly at the Opéra-Comique where in 1913 he created the title role in Gustave Charpentier's JULIEN. His varied repertory is well represented in recordings made between 1903 and 1926: his voice is strong and clearly defined, his style authoritative in declamation and well mannered in more lyrical music."